Have a burning question about flying with Bering Air? We’ve got you covered! 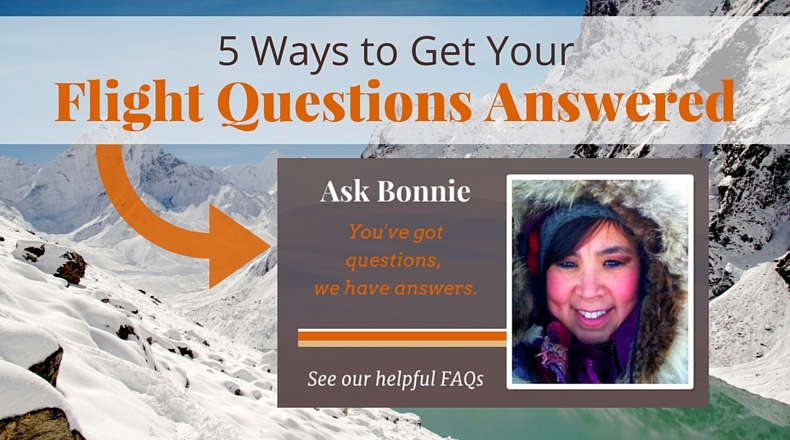 Here are some great ways you can get your flight questions answered today. Did you know? BeringAir.com now offers a live chat feature, so you get answers and resolve problems faster with real-time assistance. It’s a convenient way to chat with Bonnie directly, plus you’ll experience shorter wait times than when you call in. Option 2 – Click the Ask Bonnie link in the navigation, then click the Bering Air Live Chat pop-up at the bottom of the page. Live chat is available from 8 a.m. to 5 p.m., Monday to Friday. Holiday exceptions include Christmas (and the day after), New Year’s Day, Fourth of July and Thanksgiving (and the day after), in which we are closed and the feature will offline at that time. Check out our full list of FAQs here. You can go through the Book a Flight process to check an upcoming flight for a particular date range, or get recent flight updates by following us on Twitter. But if you’d like to have a seasonal flight schedule on hand, you can view and download a copy on our Flight Schedules page. While this PDF schedule is what we plan for, note that weather conditions can affect routing for a particular flight or cause cancellations. On the day you travel, it’s a smart idea to contact your Bering Air Village Agent to confirm the departure time of your flight. You can find your village agent’s contact information by clicking on the appropriate village name on the Destinations page. Need help getting a receipt for past travel? Contact our Nome office by phone or email and a staff member will get the research process started. Tickets can be researched for up to one year after travel. Because ticket research is a manual process, it can take up to at least one week to complete as well as get a copy of your receipt over to you. How can Bering Air better serve you? Share your thoughts via live chat or by filling out our handy contact form.